因為 Bugzilla 會將資料儲存在 database 中,Ubuntu 16.04 採用 MariaDB 為預設的資料庫系統. 雖然我 Disallow root login remotely 設定為 n , Ubuntu 還需要將 /etc/mysql/my.cnf (Ubuntu 14.04) , /etc/mysql/mariadb.conf.d/50-server.cnf (Ubuntu16.04) 裡面的 bind-address = 127.0.0.1 註記起來 (#後面文字表示為說明),才能讓使用者遠端登入. 剛剛就已經設定了 MariaDB root 密碼,接下來我們要為將來使用的 Bugzilla 建立一個資料庫,方法很簡單只要下面幾個步驟,建立一個資料庫名稱為 Bugzilla 以及使用者帳號 Bugzillasuser 以及其該使用者密碼 password,你可以依據自己的喜好來命名. 試一下剛剛建立好的 bugzilla 資料庫和使用者吧! !這邊要輸入的密碼是 bugzillauser 的密碼,我剛剛設定的是 password. Bugzilla 使用 CGI (Common Gateway Interface)-perl 的網頁程式語言. Bugzilla 設定檔 localconfig ,需要輸入 web user (Ubuntu 為 www-data), 以及資料庫對應的位置,資料庫名稱,使用者及其密碼. # as root or as a user who is a member of the specified group. # The DNS name or IP address of the host that the database server runs on. # SQLite, this is a name (or path) for the DB file. sunchiahome@gmail.com is now set up as an administrator. 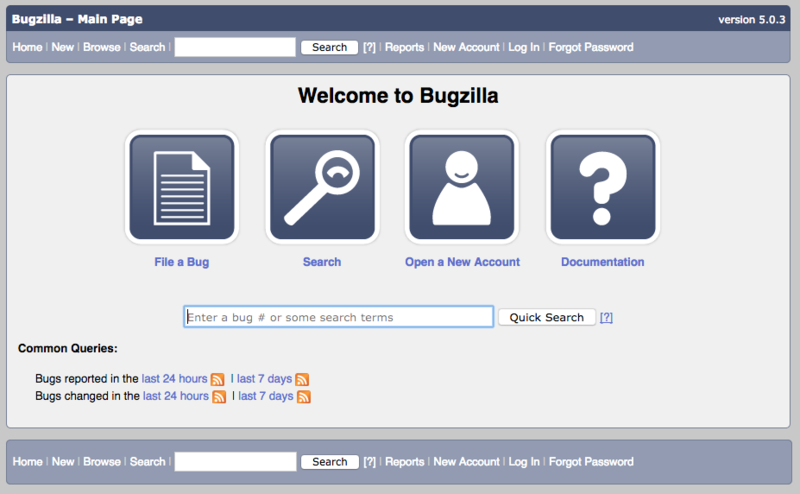 在 Log In 輸入剛剛在安裝的 admin@ooxx.com 與密碼即可登入 bugzilla.